So happy!! So many babies! Babies everywhere! 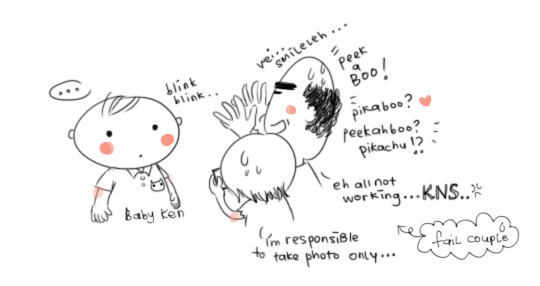 Even baby Ken was there! Can't believe baby Ken is 7 months old now! SO CUTE!!!! This is the best time to play with :D Cause they are big enough (can carry around and throw kaka :D) but have not learnt how to walk yet, means can't run away from us when we ask "paopao"! i think almost everything also we do edy. all kinds of actions, all kinds of reactions, all kinds of sound. sigh* we have a longlong way to go. Do you know how it feels?! It's like taking out an updated, brand new machine gun, (everyone by now would be staring or at least looking somewhat at you, got semi pro camera means got at least some semi pro skill right?! ) 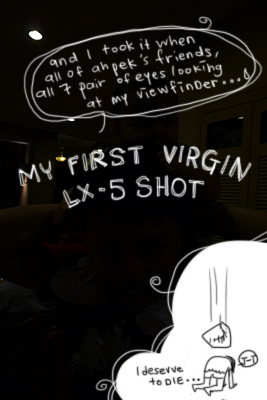 and your bullet just have to miss the enemy-_- (like how my photo turned out black-_-) One of his friend even asked "eh, why blackblack wan?" "Must do with actions, they will understand one!" Can't imagine acting out THREE LIL PIGS, all by myself! lol. too excited for first shot, huh? ef.ae : yes! Hahah Until i did not set any settings-_-! Ken Wooi : Yes! baby ken! :P Cutenye! Pou Leen: LOL! I should have just sneezed then!-_- much easier!